2014 Donate Life float themed "Light Up the World"
Emory islet cell transplant recipient Julie Allred decorates the Donate Life float in Pasedena on New Year's Eve. Emory transplant surgeon Dr. Nicole Turgeon decorates the Donate Life float. Dr. Nicole Turgeon hard at work decorating the Donate Life float. 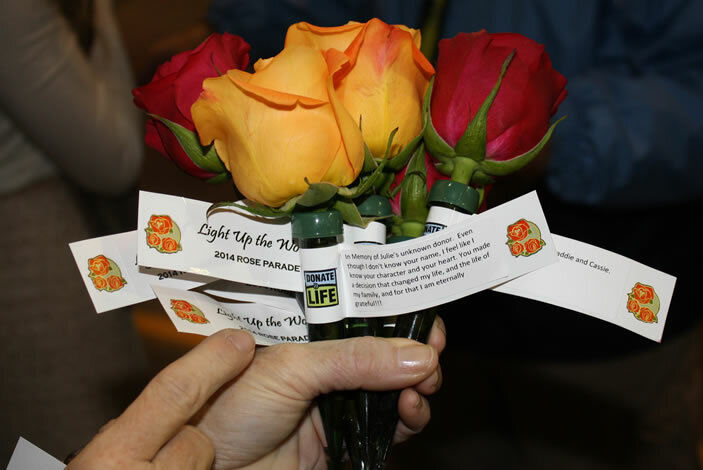 Roses with special messages written to Julie Allred's donor. Liver transplant recipient Amy Tippins says riding on the Donate Life float was a way to say thanks to her donor, and the thousands of other donors who give the gift of life. A Donate Life volunteer sprays water on the flowers before the parade begins. 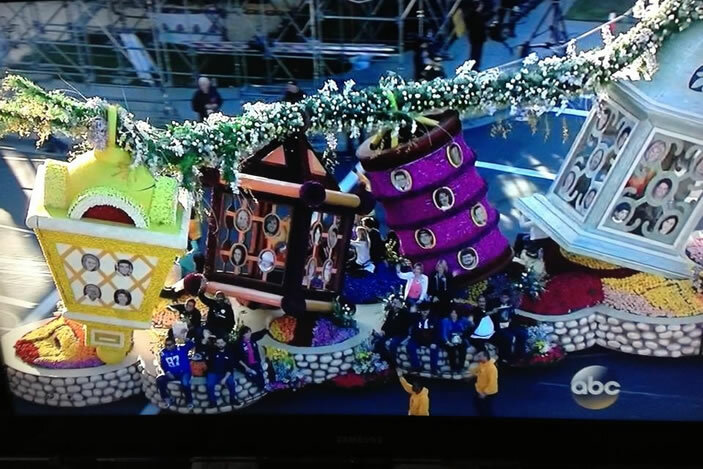 Two Emory transplant patients and an Emory transplant surgeon "floated" into the New Year in Pasadena, Ca. 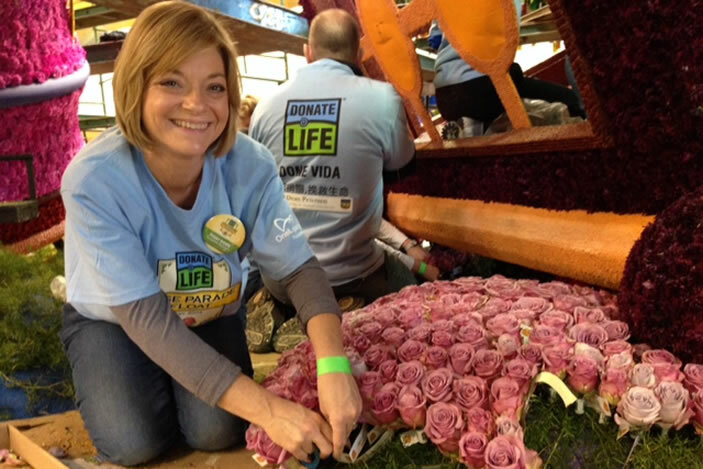 The two patients, islet cell recipient Julie Allred and liver recipient Amy Tippins, were invited to ride on the Donate Life float in the Rose Parade on Jan. 1. The float, with the 2014 theme of "Light Up the World," honors donors, recipients and their families who have been involved with organ, eye or tissue donation. 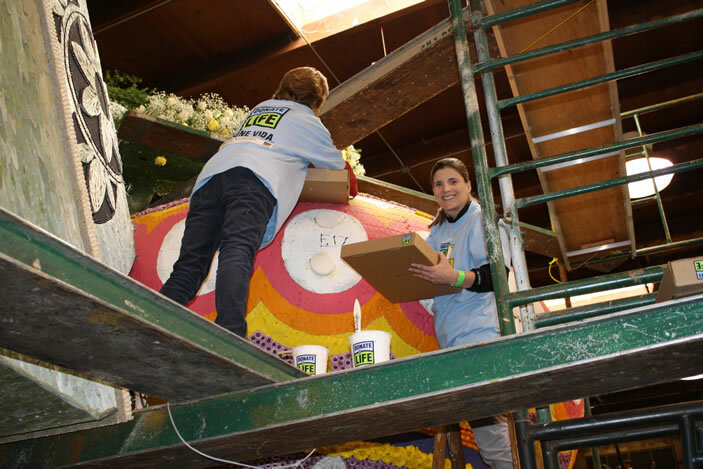 "To have the opportunity to decorate and then ride on the Donate Life float in the Rose Parade was an amazing experience and one I will never forget," says Allred, who developed Type 1 diabetes at age 10. After years of struggling with her diabetes, she received two pancreatic islet cell transplants through a clinical trial at Emory, one in 2011 and another in 2012. "Someone always had to be with me prior to my transplants," says Allred. "After living with Type 1 diabetes for 33 years, it was controlling me and all aspects of my life. The unpredictable, unrecognizable episodes of hypogylycemia, or low blood sugar, were putting me in daily life and death situations. The donor islet cells have given me the chance to live a normal life, and a life without low blood sugars." Allred has since returned to the workforce and is a school nurse in Concord, N.C., where she lives. Emory doctors told Tippins she needed a new liver when she was just 17 years old, after being diagnosed with hepatic adenomas, rare benign liver tumors. After a short six weeks of being wait listed, she received a donated liver, which turned her life around. "I am a true testament of how a transplant can save a life," Tippins explains. My illness was so severe, many experts are amazed I survived to see age 17." Twenty years later, Tippins, who lives in Norcross and owns two companies, says her life has never been fuller. 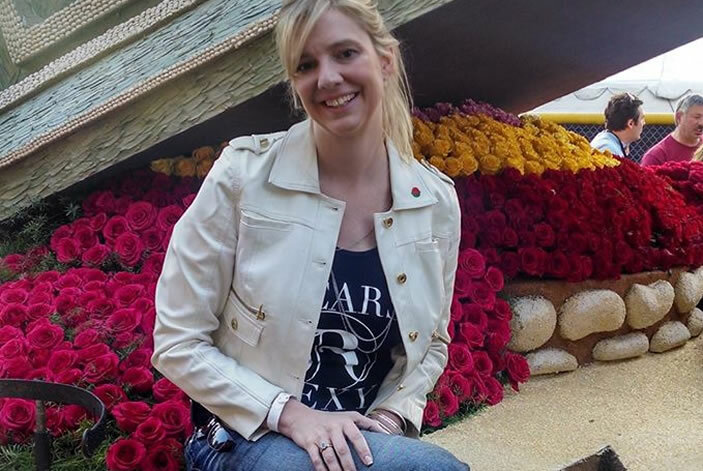 "For me, riding on the float not only gave me the chance to say thank you to my donor, but also to the thousands of donors and their families who give selflessly during a time of tragedy, so others can live." Nicole Turgeon, MD, Emory transplant surgeon and surgical director of the Paired Donor Exchange Program (who is also Allred's surgeon), joined Allred and Tippins in Pasadena for the float decorating process. 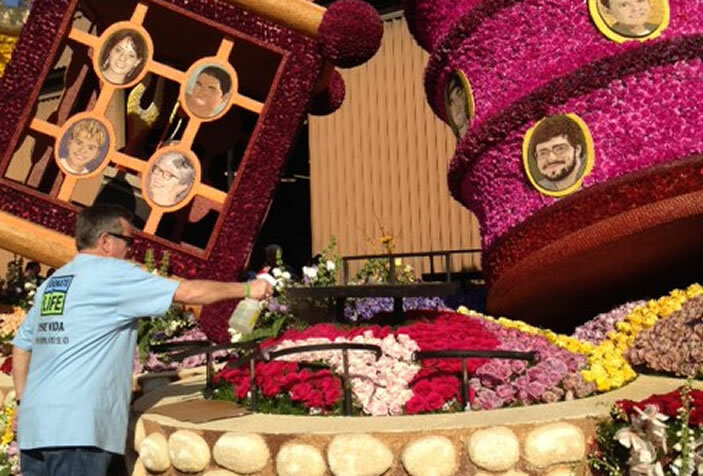 They spent most of New Year's Eve day and night (about 15 hours) adding hundreds of flowers and other decorations to the float. 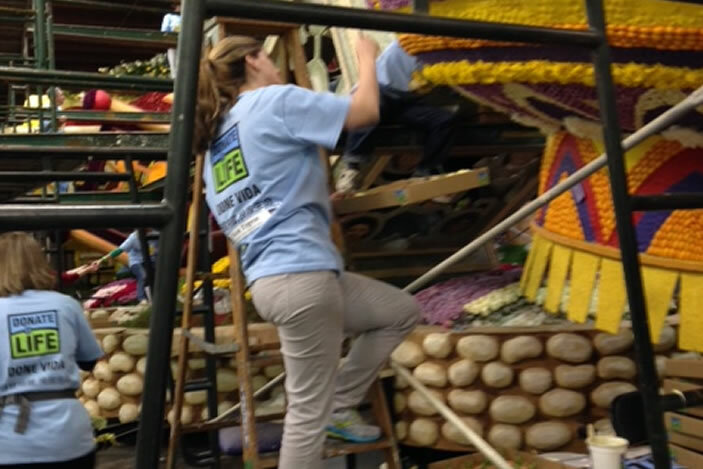 "Decorating the Donate Life float is one small way recipients, families and health care providers can give back for the sacrifices that are made as one suffers loss then chooses to give life to another," says Turgeon. "The message is very powerful, and we hope it reminds others of the importance of organ donation and the decisions they make." This is Turgeon's second year to help decorate the Donate Life float. This year's float, themed "Light Up the World", featured a festival of lanterns illuminating 30 riders, all grateful organ and tissue transplant recipients. Twelve living donors walked beside the float in the parade to demonstrate their vitality post-donation. Deceased donors, 81 in all, were remembered with their memorial floragraph portrait posted on the large lanterns. Donate Life describes the donor's gifts of life as lights that shine on us all.